Take a moment today and write out a list of everyone you plan on giving gifts to this holiday season. You can include your family members, extended family members, neighbors, coworkers, teachers, caregivers, and others who serve you, such as your letter carrier and hairstylist. When you’ve listed everyone, write the dollar amount that you want to spend on each person. Tally up these figures to find your total holiday budget. As you shop holiday sales and buy gifts at a discount, deduct the retail price of your gifts from your gift budget rather than the sale price. Your loved ones will still get all the value you planned on giving, and you won’t be as tempted to buy extra gifts to meet your original limit. You can also use some of the extra budget to buy small gifts, like tins of cocoa or boxes of chocolate. Then when someone unexpected gives you a surprise gift, you’ll have a gift on hand to reciprocate. From now until the end of the year, most of the gifts on your list will be on sale at one point or another. The challenge comes in weaving limited-time sale opportunities into a busy holiday schedule. Use your planner to make the process more transparent. As you browse through the mailing lists from your favorite retailers, mark down the promotional dates and amounts in your planner. When everything’s down on the page, you can see the big picture, letting you hit the best sales while taking fewer last-minute trips. Ben Franklin said it best: “Haste makes waste.” Many sites list holiday shipping deadlines, their recommended ordering date for delivery by December 24. Take a look at these deadlines and mark these dates in your planner. Then you won’t be left hovering over the mailbox, or doubling the price of your gift for overnight shipping. This is also a good practice if you participate in free shipping programs, such as ShopRunner. Give your orders a head start, and they won’t get caught in the crowd of the procrastinators’ orders. The biggest key to any budget is mindfulness. 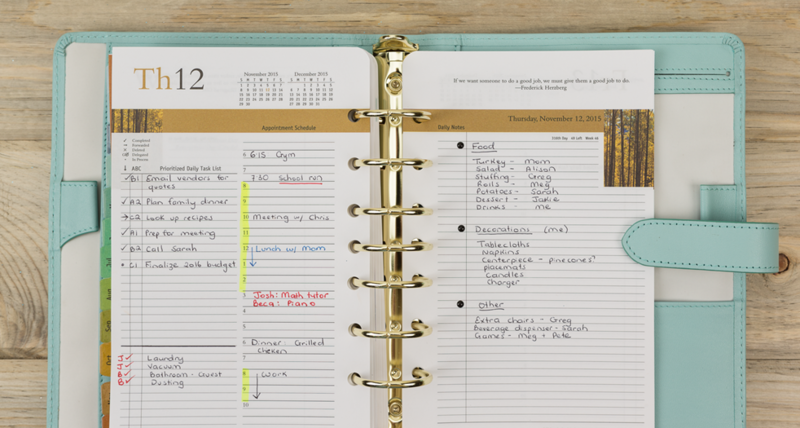 With daily and weekly planning sessions, your FranklinPlanner can ensure that you make it through the holiday season with peace of mind as you celebrate what matters most.